I’m Fatehdeep Singh from Rome, Italy. Coming from the information technology field (my job) and different sports played since my childhood. The practice of physical activity has always been a constant in my life as well as my interest and admiration for martial arts and spirituality. 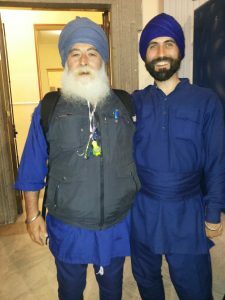 HOW DID YOU GET INTO KUNDALINI YOGA AND GATKA? I started to develop and interest in Yoga in 2007, while I was already practicing the martial arts of muay thai and boxing. I started practicing Hatha yoga, immediately appreciating its physical benefits in terms of strength, flexibility and agility. Given the remarkable benefits that I found, I decided to integrate the yoga practice in my usual workouts. Over time, I realized that the practice was not only working on my physical body but also on a subtler level. The breathing techniques, the concentration and the presence of asanas that yoga required, were the starting point for a more careful observation of myself. In 2011 I met Sujan Singh and Jot Prakash Kaur, and with them I started the practice of Kundalini Yoga according to the teachings of Yogi Bhajan in the Yoga Jap Center in Rome. Also thanks to them I got to know Datta Kaur, a very good teacher of Kundalini yoga, promoter of the project “Yogare per crescere” teaching yoga to children. She is also a very talented astrologer. Thanks to her I am passionate about astrology and under her guidance I started the study of this fascinating art that I continue to deepen day by day with the study of tantric numerology as taught by Yogi Bhajan. The practice of Kundalini yoga, in addition to the remarkable psycho-physical benefits, gave me a strong impulse to know more and so I decided to undertake the training course for first level teachers then continuing the study with the teacher second level, completed in 2015. Destiny put on my path Guru Shabad Singh Khalsa De Santis, teacher of Kundalini Yoga and Gatka, bodyguard of Yogi Bhajan and his direct student, from whom he directly received the assignment and the honor of spreading and promoting Gatka practice in the Western world. 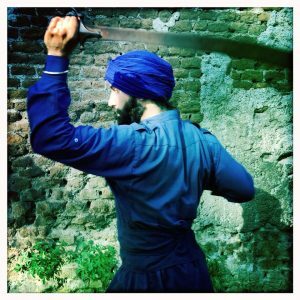 The passion and great dedication with which Gurushabd transmitted the knowledge of the Gatka united to the elegance and the great sense of balance that his movements transmitted, instantly fascinated me. I had never seen a martial art of that type and having always had a special admiration for this kind of disciplines I decided it was definitely for me. 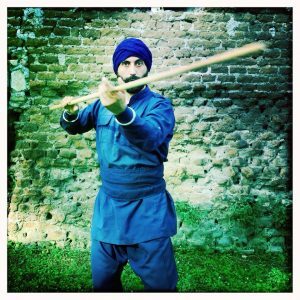 After a period of practice I started, under the guidance of the teacher Gurushabad, the study to learn Gatka techniques through a specific teacher training. Even today, I continue to study and practice with students and with the teacher, assisting in the dissemination of teachings in Italy and abroad. 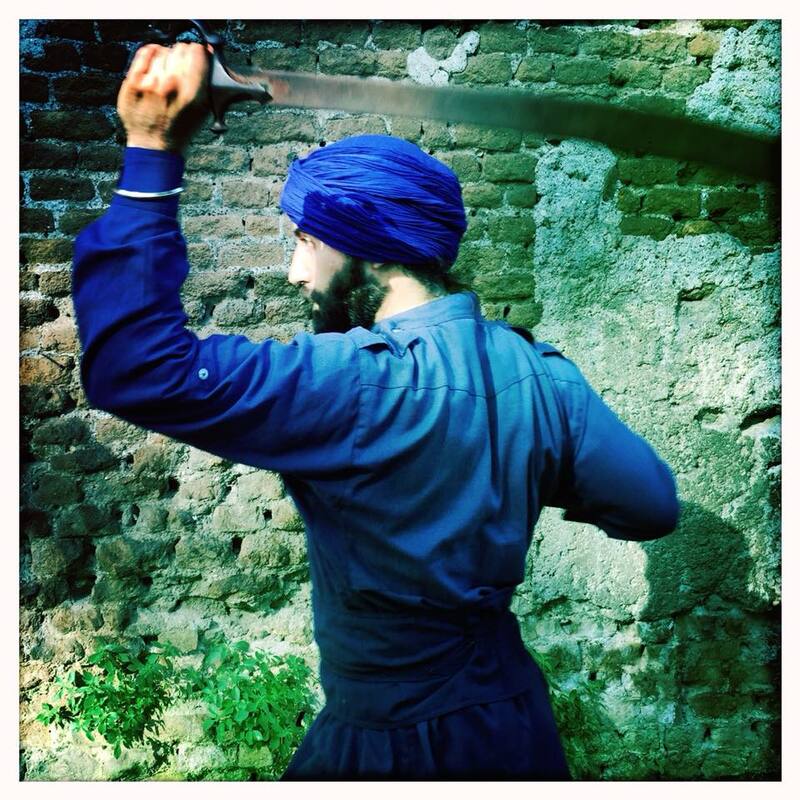 Kundalini yoga and Gatka are like brother and sister and I consider them a bit like my older brothers. Of course, cohabitation is not always easy, as we know, even brothers often have quarrels but they are very compassionate siblings, teaching me a lot. They are excellent advisors but also require respect and discipline. I did learn with this special brother and sister. My experience with them teaches me every day that nothing is achieved without commitment, dedication, respect and discipline. I feel constantly evolving, I consider myself an eternal student, the exams you have to face during life are many and sometimes you have to take them several time before you can learn the lesson. After all, I believe that life is a continuous process of learning that goes through one’s own personal experiences. 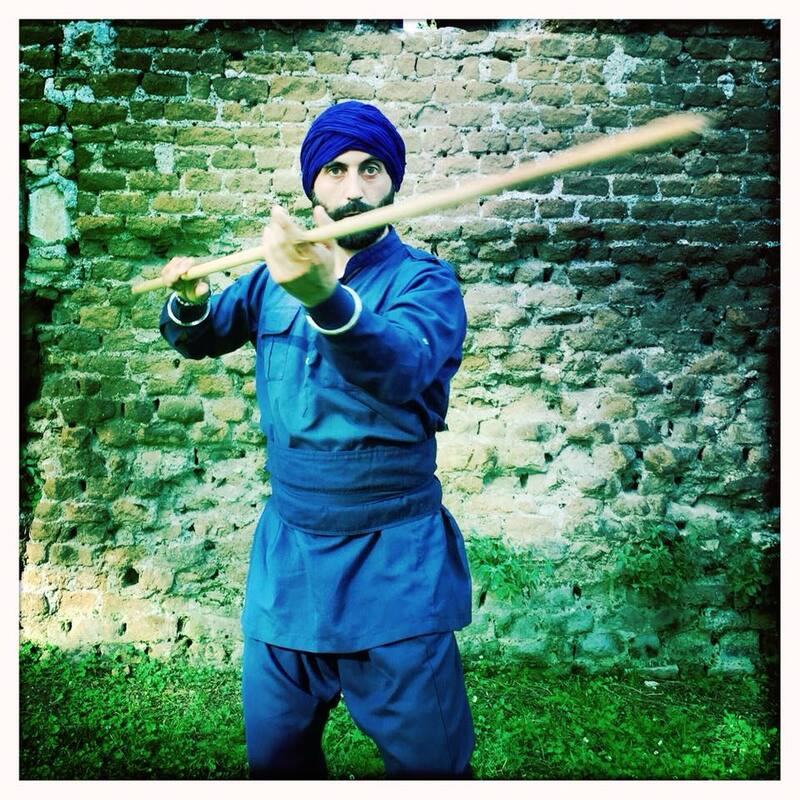 WHAT DOES YOUR YOGA/GATKA PRACTICE LOOK LIKE NOW? Honestly, I do not hide that sometimes with my practice I have a rather stormy relationship like a boat at the mercy of a very rough sea. Yoga tells me: “Be a Saint”; Gatka tells me “be a Soldier”, and I say: I just want to be myself. These are the challenges of my practice: to be myself and find the right balance, to achieve peace even when the sea of life seems particularly rough. 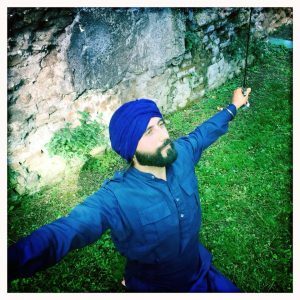 WHAT’S YOUR FAVOURITE KUNDALINI YOGA OR GATKA PRACTICE? Sat Kriya. It is excellent for strengthening and stimulating the natural energy flow throughout the body. Overall, my physical health has improved because all the internal organs receive a delicate massage from this exercise. The heart is strengthened thanks to the rhythmic raising and lowering of the blood pressure that is generated by pumping the navel point. My other favorite practice is to rotate the sword around my body according to the movement of the folded “∞”, moving in the surrounding space at 360 degrees. The motion of the sword, at a subtle level, expands the electromagnetic body field (Aura) and induces the two cerebral hemispheres to work synergically in an harmonious way, stimulating a balanced use of both parts of the body as well as all the brain functions. Moreover, the spinning of the sword around the body, according to the movement of the infinite, favors the removal of the negative energy influences present in the Aura. WHAT’S BEEN THE MOST POWERFUL PRACTICE YOU’VE EVER DONE? Surely my first time at the Yoga Festival in France has left its mark. The three-day practice of consecutive white tantra was strong and intense but also fun and carefree. Also during the yoga festival I also had the opportunity to teach Gatka to children; many children of different nationalities with a great desire to learn while having fun.That was an experience that gave me a lot, the children can really teach us adults a lot. HAS ADOPTING YOUR SPIRITUAL NAME CHANGED YOU? My spiritual name is Fatehdeep Singh. In Gatka we say “… .wahe guru ji ki Fateh”, Fateh means victory. Says Yogi Bhajan: “… give your victory to God; but if you want to give victory to God first you must win, you cannot give your defeat to God. If the spirit of life is connected with God you will have the victory of time and space, the victory of the Self. My spiritual name reminds me that the biggest challengs is to win myself, so I can to accept and integrate every part of me, even those that are difficult to face. This way peace and inner harmony can reign steadily. It’s a great challenge but also a great goal to reach. FAVOURITE QUOTE? Find yourself in every Star! Reach every possibility! YOU IN A TWEET? Do not ask me who I am because I still do not know how to answer you. BOOK? I still do not know exactly. PLACE? A quiet place in the green, perhaps with a river and a small waterfall. TEACHER? Sujan Singh and Jot Prakash Kaur, Guru Shabad Singh Khalsa De Santis, Sada Sat Singh, Datta Kaur and Siri Kartar Kaur (Yoga and Gatka instructor, musician and artist) living example of a warrior princess.